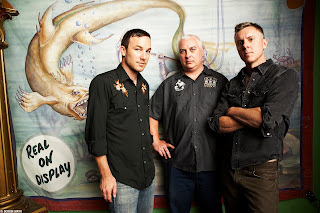 The Toadies are back. They are out from underneath the corporate umbrella and have signed with an independent label and are free to do what they want. Despite breaking up nearly seven years ago, the boys of Fort Worth have done more than getting back together for a reunion show. They are out from underneath the corporate umbrella and have signed with an independent label and are free to do what they want. The story began in 1989 when Vaden Todd Lewis and Lisa Umbarger met while working together at a record store in Fort Worth. They both liked the same music, so Todd taught her how to play bass and they started a band called The Toadies together. After making several demos in his bedroom, the group signed a deal with Interscope Records and released Rubberneck in 1994 that produced the hits “Possum Kingdom,” “Tyler,” “Away,” and “I Come From the Water.” It sold 500,000 copies within a year, gaining gold status and went over the 1 million platinum mark in 1996. After going through two guitar players, Vogeler joined the band in 1996 and they toured like crazy in support of their successful debut album. Then trouble began with the record label. After the tour, they went into the studio and recorded Feeler but Interscope canned the album and the band grew frustrated and had to take a break. When they finally returned to the studio, Vogeler said they used some songs from that recording and created their second official major release, Hell Below/Stars Above in early 2001. They began the tour but Umbarger left the group and the band broke up just five months after their second release. During the breakup, Lewis and Rev. Horton Heat drummer Taz Bentley formed the Burden Brothers, drummer Mark Reznicek joined a country act called Eleven Hundred Springs and Vogeler moved to California and went to film school. The Burden Brothers released two albums and toured for years and the Toadies reunited March 11, 2006 for a one-night show then played a few more gigs here and there. Vogeler thought they were going to do a few shows but Lewis parted ways with his band and called him and Reznicek in August of 2007. The band signed a deal with indie label Kirtland Records and recorded No Deliverance, which was released in August. But after seven years, will there be a warm reception waiting for them? Before the new album, you could catch a Toadies’ song on the radio or even play along with “Possum Kingdom” on the video game Guitar Hero II. Older and wiser, hopefully the days of breakups are long gone. ©88 Miles West- All Rights Reserved.. Simple theme. Powered by Blogger.